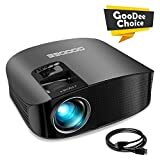 DBPOWER Mini Video Projector Multimedia Home Theater is currently selling at $59.99, approximately $5.54 lower than average, giving a potential saving of $10.00 right now. With a lowest price of $59.99 and an average of $65.53 it is selling on the low end of its usual range. Price volatility is 0.3% (meaning it does not change often), so the price should stay low for a while. Right now this product is a recommended 'fantastic deal'. The current deal is also the best price on this item over the last month. 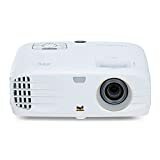 Compare the current price, savings (in dollars & percent) and Buy Ratings for the top Portable Projectors that are closely related to DBPOWER Mini Video Projector Multimedia Home Theater. Here is how DBPOWER Mini Video Projector Multimedia Home Theater compares with other leading Portable Projectors. DBPOWER mini video projector is the best choice. 1. Why choose DBPOWER T20 portable mini projector? Upgraded LED light technology - more bright than other projectors Updated fan Sound and System - the fan noise is lower than other basic LED projectors Large Screen - relax your eyes from TV Keystone Function - adjust the image size to be normal. 2. Specifications: Imaging technology: TFT LCD, Contrast: 2000:1 Aspect ratio: 16:10 Projection ratio: 1.4:1 Native resolution: 800X480 pixels Supported resolution: 1920X1080 pixels Keystone: Manual correction 15¡ã Throw distance: 1.5-5M Screen size: 20-170 inches 3. Warm notices: 1) Not recommended for PPT, word, excel or business presentation. 2) To connect DBPOWER mini projector with iPad or smart phone, you need a wireless HDMI adapter (A MHL to HDMI cable for android phone and a lighting to HDMI adapter cable for iPhone/iPad). 3) To connect the mini video projector with PC/ laptop, please adjust the PC/laptop display resolution to 800*600 or 1024*768, which can provide the best clarify. Please note it has SUPER clear image in dark room, but halves the effect in the light. 4) NO SD port, Connecting to SD card, please buy a SD Reader 4. Packing contents : 1 x DBPOWER mini projector 1 x remote control (battery is not included) 1 x 3 in 1 AV cable 1 x HDMI cable 1 x user manual FeaturesBRIGHTER & SHARPER: This mini projector features 27 color-enhancing technologies, which bring you a 70% brighter and 50% sharper image than other comparable mini projectors on the market. It's great for home entertainment and we recommend you keep it that way. 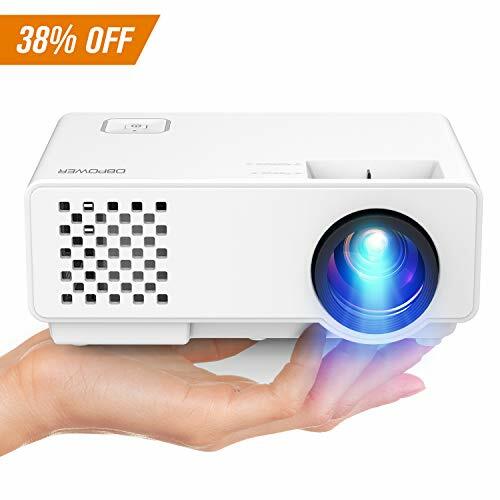 Not recommend for PPT or office presentation purposes.THE #1 OPTION FOR YOUR HOME ENTERTAINMENT: With an extended LED lamp life of an impressive 50,000 hours, as well as support for 1920x1080 resolution and a 2000:1 contrast ratio, this is the ideal projector for your home entertainment.176" BIG SCREEN & STEREO SOUND: This projector provides you with a screen size from 32" to 176" at a projection distance of between 1.5 to 5.0m. A projection distance of about 2m is the recommended for the optimum viewing experience. It also features built-in stereo speakers, making it the #1 addition to your family movie nights.MULTIMEDIA VERSATILITY: This full-HD projector has support for HDMI/AV/VGA, which allows you to use it with laptops/PCs/TV Box/Amazon Fire TV Stick/Chrome Book/Tablets/Blue-ray DVD players/USB flash drives/media players(music, pictures, videos)/iOS/Android (Wireless HDMI dongle NOT included).